It’s always good to reflect at this time of year. The New Year presents us with a fresh start, a way to begin again. For some, resolutions are made and quickly forgotten. For others, these are just more of winter’s dark days. It’s easy to get caught up in the bustle of this time, the catching up from our ‘down time’ over the holidays. It’s easy to let the cold and dark of the winter start to affect our mood and, before we know it, one day seems just like another – long and tiring. 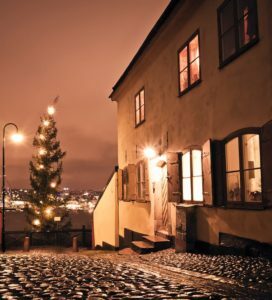 In Sweden, at this time of year, when the winter sun sets in midday and the nights are long and dark, every home and apartment shine a light in a window creating a warm glow, lighting the way for others. Walking through the night streets, those lights feel welcoming and the glow in the glass emits a feeling of hope – a feeling that no matter how cold and dark it may be outside, what lies within is warmth and kindness and hope. This has always been the feeling behind the red brick walls of Kenosha Human Development Services. For so many, throughout the years, coming to KHDS has been the fresh start needed, a way to begin again. Whether that start be connecting with a mental health provider who understands, finding safe, affordable housing, receiving services for a disabled child, or finding a foster home where there is love KHDS has offered the people of Kenosha warmth, kindness and hope. But there is still so much to do! As we enter this New Year, we look eagerly forward to all the growth and change that will come! Every day we welcome new employees to new positions as programs grow and evolve to meet the needs of those we serve. We embrace each new problem as a challenge to be met and conquered because we believe that we can and do make a difference in the life of this community. And so, it is with an open heart we wish you all warmth and kindness and, most of all, hope for this New Year!